It’s important for our young readers to understand that phonemes (sounds) can be represented by multiple spelling patterns. Teaching students the spelling patterns for different sounds is critical for accurate decoding and encoding. When the /k/ sound is at the end of a word it can be spelled with either the letter “k” or the letters “ck”. When the final /k/ sound is preceded by a vowel team or a diphthong (e.g. ou) it is spelled with a “k”. For example, the words “break”, “beak”, “seek” and “soak” all have a long vowel sound before the final /k/ sound and therefore is /k/ is spelled “k”. When the final /k/ sound is preceded by a short vowel, the sound is spelled with “ck”. Here are a few examples: “chick”, “crack”, “slick”. Notice that the vowel before the final /k/ sound makes its short sound. Sorting activities are a great way to introduce this spelling rule (or really any spelling rule). Having the student actually write the final “k” or “ck” just helps the students use the rule when writing. 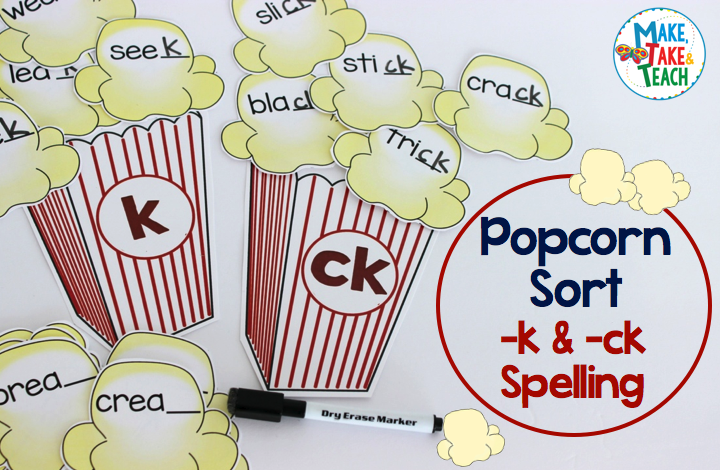 When you download the popcorn sort activity you will receive 66 popcorn kernels with words ending in either “k” or “ck”. This activity also has a self-checking feature which makes it ideal for independent centers! This activity can be found under the Advanced Phonics tab on our home page!